Free Chess game available for BlackBerry! Here's a fun addition for those of you that like having games on your BlackBerry. 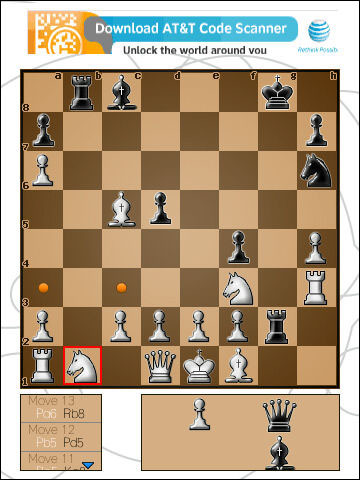 Free Chess v1.3.1 by Solverlabs was recently released in the CrackBerry store, and as the name implies it is FREE, which is great to see. The game features five levels of difficulty for play against the computer, with the first being super easy. If you're a beginner, this is the level for you. When you click the piece you want to move, the game shows you which spaces you can move to. I played around on this level a bit even though I know how to play Chess, and even when I set up the opponent to take my piece, it typically wouldn't. That's kind of cool I think, so that you can get a feel for the way each piece can move around the board. If you can't finish the game in one sitting you can save and reload your match at a later time. As mentioned, this is a free app, which means it is ad supported. I didn't find the ads to be intrusive, but if you download this version and they really bother you, there is also a paid version available in BlackBerry App World. It looks like Free Chess is available for all devices running OS 4.6 and above. The Torch (and BB6) was not listed but I took a chance and downloaded it and had no problems playing in portrait mode. Landscape mode didn't display properly, however. The description also mentions being able to play in 2-player mode. I didn't see this option in the free version, so I'm guessing that is another perk of the paid version.